"I'll Show You How To REALLY Make Money In The Markets!" "And How To Make REAL Profits!" My Videos And Recorded Real Time Live Trading Sessions with Precise Instructions Explaining The Strategies will make It Super Easy For You To INSTANTLY Understand My Highly Effective Strategies And Show You How To Use My Strategies In Real Market Conditions In Order To Make REAL Profits! 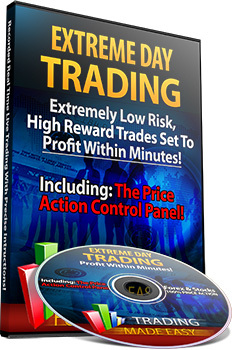 The Extreme (Day) Trading System - Extremely Low Risk, High Profit Potential Trades Set To Profit Within Minutes! In the Extreme Trading Video You'll See How I Day Trade The System LIVE, Using My Own Money. My Profit: $480 In Less Than One Hour! I'll Explain Exactly How The Strategy Works And How You Can EASILY Use It RIGHT AWAY! But the real "Secret" behind my system is the "Price Action Control Panel"...I'll Show You Exaclty How To Set It Up! $47 Special Offer Order Today - Might Not Appear Again! Disclaimer: Trading involves risk and is not for all investors. Past performance is NOT indicative of future results. Nothing contained herein shall be construed as an offer to buy, sell, or hold securities of Futures, Stocks, Forex and Options. This is intended for informational purposes only. Trading involves risk and should be pursued with risk capital only!